A simple and flexible voice service for branch and small offices. 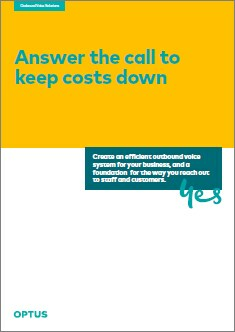 Are you looking for a voice solution for your small or branch offices? Optus Evolve DirectLine offers a simple and flexible way to connect to the Public Switched Telephone Network and manage incoming and outgoing calls. Optus Evolve DirectLine is designed specifically with branch and small offices in mind - providing simple connection to your analogue premise-based telephone equipment (handsets, fax machines, modems) or to a compatible PBX or key system. Below are just a few of the many features and options that can help your business become more productive when using Optus Evolve DirectLine. Service you can depend on - Your Optus Evolve DirectLine service provides reliable phone connections with 24 x 7 support. Improved business efficiency - A wide range of features are available to make handling incoming and outgoing calls easy. Value for money - We offer flexible pricing plans and special low rates for calls between directly connected sites and to Optus mobiles. Our competitive call costs are charged per-second, so you only pay for what you use. Easier cost management - Our powerful billing and reporting services can be tailored to your organisation's requirements. When you are ready to move to IP networking and IP voice trunking we can provide a migration path to Optus Evolve Voice. 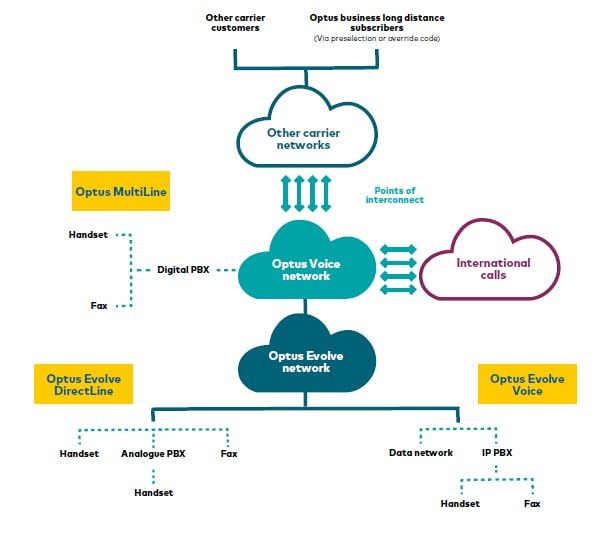 Optus Evolve DirectLine is for direct connection to analogue PABXs, key systems, handsets or other equipment. All call types are supported including Local, National, Fixed to Mobile, International and Directory Services. Optus Evolve DirectLine is compatible with most analogue handsets, faxes, modems, EFTPOS terminals, PBXs and key systems. Connected devices must conform to AS/ACIF standards S002 and S004. Local Number Portability allows you to move your inbound telephone numbers to Optus, so there is no need to change your contact numbers when changing carrier. For guidance on porting your telephone numbers to Optus download Optus Local Number Portability. Optus Evolve DirectLine is one of the available Optus Outbound Voice Solutions. Billing for OMVS+ may be bundled into a fixed fee per user per month, or service components may be billed separately. What number do I call for billing enquiries? Please call the billing contact number on your invoice, your assigned service desk or otherwise call 134 315, Monday to Friday 8:00am - 5:30pm AEST for other enquiries. A simple capable voice service suited to branch offices. Your voice services need to keep up with your business. Hold small and large meetings by audio conference. Enjoy the simplicity of dealing with one provider for a complete business telephony solution.